Another Awards Show down and more beauty and fashion of the stars to talk about! The SAG Awards were on this Saturday just passed and when such gorgeous photos kept coming out of the event I knew I had to do another Beauty and Fashion Favourites similar to that I did for the Golden Globes (you can read that HERE). So grab some tea and sit down for the rundown on my top four beauty and fashion picks of the night. Come on you were expecting this one but I can honestly say that my love for J.Law did not cloud my judgement when choosing her as a favourite, her beautiful gown chose for me. Jen was wearing this unique and eye catching Jimmy Choo gown that was almost holographic it was so interesting. She paired the gorgeous strapless dress with statement dangle earrings and a basic clutch, who needs accessories when your dress looks like the night sky so I say she put it together perfectly. As for beauty, Jen had flawless and dewy skin with hints of coral in the blush and lipstick. Defined eyes and brows also helped pull this look together perfectly. I think it's safe to say that Sofia has the most GLAMOROUS ensemble on the red carpet this SAG Awards! The intricacy of the silver beading on this dress by Donna Karan Atelier is insane. She looks more than a million dollars in this glittery strapless piece and not to mention the diamonds encrusted upon her neck, it screams Gatsby and 1920s. I love the finger wave hair, winged liner and beautiful cranberry lip, it's great to see someone not going so neutral with their makeup on the red carpet. We know her as the dressed down middle aged mum from Breaking Bad so I actually think my jaw dropped when I saw Anna all dolled up in this incredible midnight blue gown by Monique Lhuiller. Can we just take a moment to appreciate the theme that went into her outfit...if you can spot the Breaking Bad reference on her clutch then I bet she is now your idol. How badass to advertise your series through your red carpet outfit. Also those teardrop earrings match the dress perfectly and the coral lip is to die for, strangely going well with the deep blue dress. 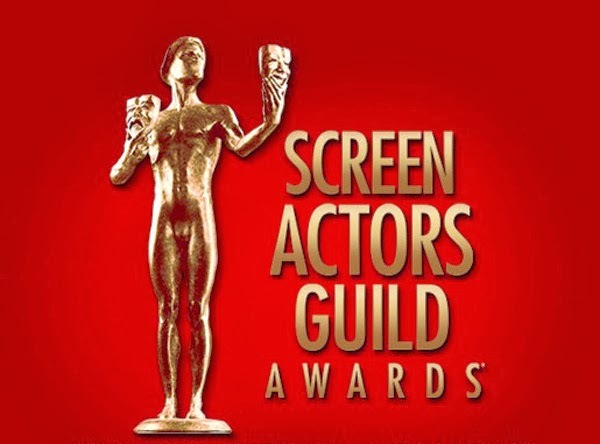 Who wore your favourite look this year at the SAG Awards?